Whalers (and other) stuff for sale! HIGHLIGHTS In 1995 Darren Turcotte records his 300th career NHL point (an assist) vs the New York Rangers. In 1995 Geoff Sanderson records his 100th career NHL assist vs the New York Rangers. 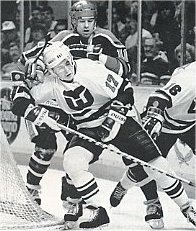 In 1995 Mark Janssens plays his 200th career Whalers game, recording an assist vs the New York Rangers.